Perfect for house decoration, gift item or a spa uses. 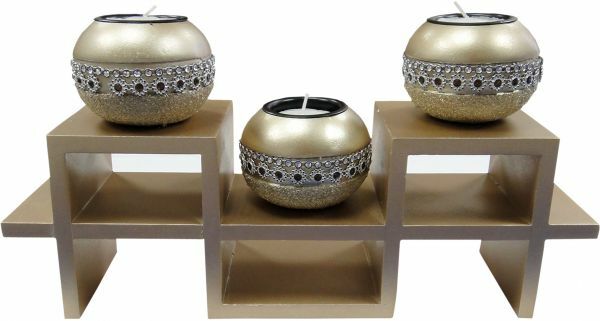 Handmade Beautiful Tealight Brass finish Designer Candle Holder. Add Beautiful Touch on This Christmas and Diwali to Your Home. Enhance the beauty of the house. Set Includes :- An Idol of Ganesh, 2 Glass Tea ligh holder anda Block of Wood on which idol and tealight holder will be placed. Tea light candles not included in the box. Gift your loved ones this Ganesha T-Lite Holder.